Snapshot for February 6, 2006. In federal budgeting, what is said and what is done can be very different. Past talk of spending cuts by Republicans has not panned out. 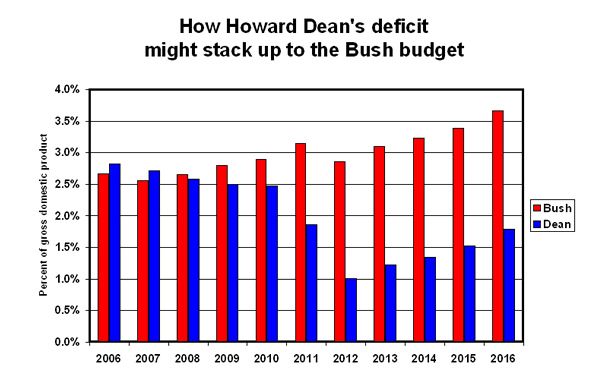 A comparison of Bush policies, judging by performance to date, suggests that a Howard Dean Administration would be doing much better with regard to control of deficit spending. The Bush deficit scenario, shown by the red bars, is based on the following assumptions: military operations in Iraq continue; the tax cuts enacted since 2001 are made permanent; certain long-standing tax preferences (known as “tax extenders”) are reauthorized; the Alternative Minimum Tax (AMT) is cut back so that it does not cover as many new taxpayers; and non-defense discretionary spending continues to grow at no less than the rate of growth of gross domestic product (GDP). During Bush’s years in office, the annual growth rate of non-defense outlays has averaged close to that of GDP, though for the past three years the administration has proposed and Congress has enacted somewhat smaller increases. The result in the Bush scenario is an unsustainable trend of rising deficits, relative to the GDP, reaching 3.7% in 10 years. Howard Dean criticized the Bush tax cuts and the decision to invade Iraq. He also indicated support for domestic spending growth. For the Dean scenario in this analysis, we assume that the tax cuts passed since 2001 will be allowed to expire, but that Dean would face the same costs for an AMT fix, the tax extenders, and increased domestic spending. We also assume savings from a phase-down of military operations in Iraq. The result, shown in the blue bars, is a much-improved deficit path, culminating in a sustainable level of 1.8% of GDP. It should be noted that, in the scenario where tax cuts are allowed to expire, the reduced deficit does begin to rise in the latter part of the period. This reflects the imminent retirement of the baby boomers in the form of rising health care costs. Tax increases and cuts in military spending will not solve the long-run problem of unsustainable increases in health care spending. This week’s Snapshot was written by EPI economist Max B. Sawicky.